With this week's release of Final Fantasy XIII-2 reopening the franchise discussion floodgates, commenter deuxhero makes an empassioned plea for the Final Fantasy game he believes is the best, even if nobody else does. Let's Speak Up on Kotaku. 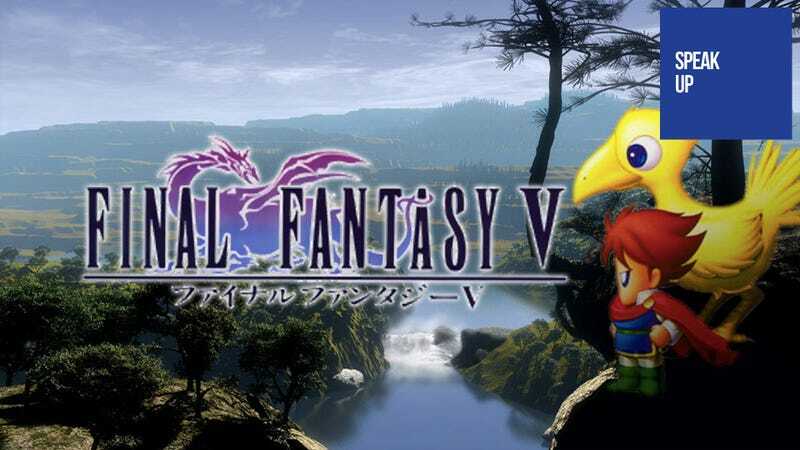 Finally Fantasy V is the best Final Fantasy of the main series, and here's why. The job system is brilliantly designed: There is no "proper" way to do anything in the game (an issue so very common with other FFs). Any job combo is possible to beat the game with (and I mean ANY, check out the annual Four Jobs Fiesta, where 4 jobs are randomly rolled). Even unusual combos can prove highly effective (I was quite happy when I discovered the power of a Berserk Monk/Barehanded Berserker by accident, especially as it has a very low AP to set up). The encounter balance is also unlike the average FF. The battles are very offense centric, which is a good thing. Rather than attrition focused boss fights of healing away damage while chipping away at massive hitpoint totals, all fights will end in under 6 turns, generally 3, but the bosses generally output nearly as much damage as you do, so it can quickly end in a game over in 3-6 turns. The overall story, while not exactly original or involving the player, has a great cast of characters with clear likable personalities (No whining about daddy issues). The characters as a group clearly show they enjoy hanging out together, and the cut scenes work well at ensuring no one is just standing in the background during them. Even the secondary characters (Cid/Mid, Gilgamesh, Ghido) have clear personalities. Also there isn't really an obnoxious romance plot we have all seen before but the writers still insist on putting in, despite Bartz being in a group of 3 girls. The graphics manage to pack quite a bit of emotion into the tiny overworld sprites, greatly benefiting from the cast's hammy nature and light tone. There is no grinding, in fact, you will be OVER leveled if you don't run from a large number of fights (and this isn't the fault of a high encounter rate either), and class setup matters far more than raw level. The death, unlike so many other deaths in Japanese RPGs, actually serves a purpose beyond shock value. When a character is killed, they die DOING something and accomplishing it. The characters don't just stand there and ignore the life restoring items you used for the past 20 hours, no they actually try to do something (it fails, but for a decent reason). Honestly, the only reason it isn't commonly considered the best is it was skipped over for international release in its first outing and the first time it got released in the US was a terrible version.